The Paralympic Route Network (PRN) comes into operation today and will be in place between 6am and midnight. 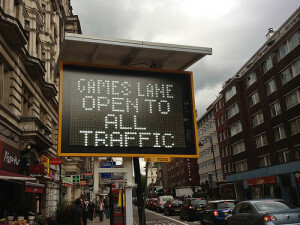 The PRN is smaller than the Olympic Route Network with just nine miles of Games Lanes in operation but will continue to be enforced in the same way as the ORN. For the first six days of the Olympics, TfL issued warnings to motorists failing to observe restrictions before switching to fines — 2400 tickets were issued. Although the widely-predicted Olympic transport armageddon didn't actually happen, TfL broke out the travel warnings prior to the Paralympics, just in case. The return of schools following the summer holidays and other events such as Premier League football matches, BBC Proms in the Park and the Thames Festival are also happening in London during the Paralympics, all of which will add to traffic around the city. As always, visit TfL's website for journey plannings and transport hotspots. The Paralympic Games are the second largest sporting event in the world and have broken records in ticket sales with an anticipated 2.5m visitors. See our guide to where to watch the Paralympics.